The model says 2:15 for Josh at Vegas. So what was Josh's final time? 2:15:19 ! He is one bad man on the bike! After finishing the development of our general model, we wanted to test how well we could predict the times of a Pro Triathlete at various events. We looked around for a Pro who posted power data from races and came across Josh Amberger. We had actually previously followed Josh’s career a bit since he road FLO wheels with much success a couple seasons ago. We also saw that Josh had recently come into possession of the newest Felt rocket ship, the IA. 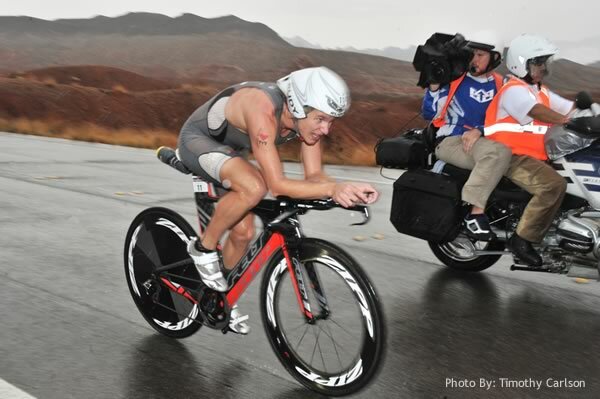 We targeted the 70.3 Worlds as our first prediction test-run. Since we didn’t have any data on the bike itself we took our "super-bike" drag number and knocked a little bit off. For Josh's power number we used his Buffalo Springs Normalized Power. So what was Josh's final time... 2:15:19! Josh later gave us some kuddos. In fairness we were close but Josh was actually right and our algorithm was off. It ended up being very close but Josh spent a huge portion of the race out front by himself, and had a power spike when Kienle went by that cooked him a bit. Later model runs showed he should have been able to go closer to 2:14 on that day. Josh was a very good sport about it all and throughout the rest of his season, he was gracious enough to send us power files (before posting them) to really help us refine certain aspects of the model. Based on his results we changed up the way we configured road conditions and added some new override calculations for drag. The new Felt is completely sick. If we ever make any money I am buying one for the company (but it will be in my size). If you are not currently following Josh on Twitter please do so and you can read more about Josh on his blog as well. He will be one to watch in the coming seasons and more importantly he is really just a good and fun person. Below are some model stats versus actuals for Josh throughout the second half of his season, along with the public BestBikeSplit links and Josh's Garmin Links. Feel free to download the .erg files from any of the links and try to see how long you can hold the power on TrainerRoad or a Computrainer. I did and it was not pretty! We want to really thank Josh for his help and plug his awesome sponsors Felt Bicycles, Zipp Wheels, Sram and Quarq!